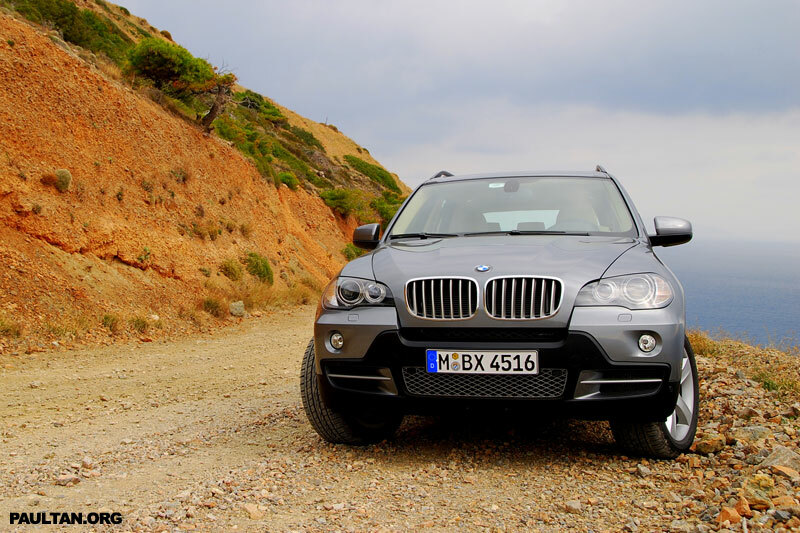 The BMW X5 has enjoyed phenomenal success since its introduction in 1999, with exactly 616,867 units to be produced by the 22nd of December 2006, with 41% of orders bound for the truck-mad USA. Thats almost 100,000 units a year in a single model alone. BMW claims to have created the Sports Activity Vehicle segment with the X5, basically a SUV which doesn’t handle horribly! 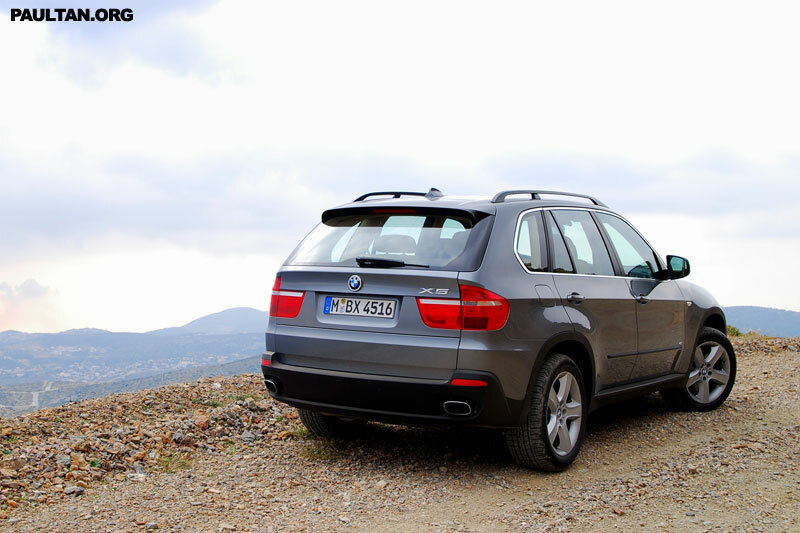 Sales every year have not dropped at all over the past 6 years, so in reality BMW doesn’t exactly need to replace the X5 so soon, but them Bavarian folks have done it anyway, with the new Bangle-fied E70 BMW X5. My report on the new 2007 BMW X5 after the jump. Click images for larger sizes. 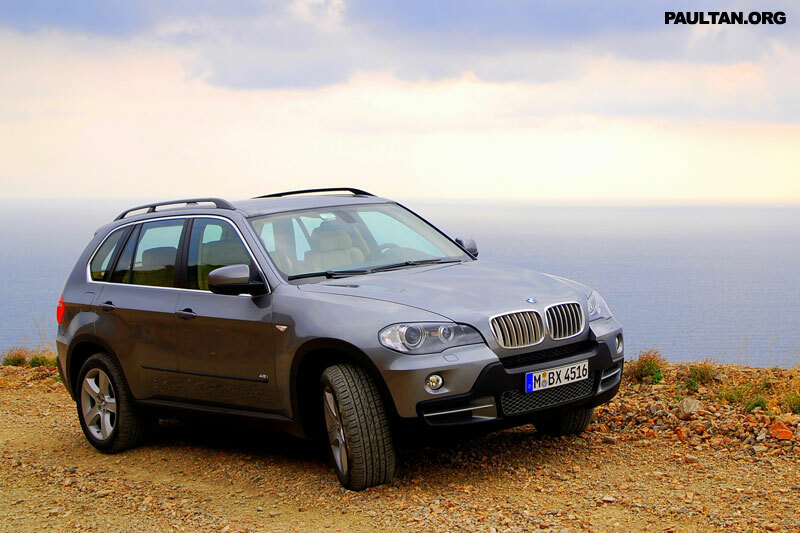 Let’s have a look at how the BMW X5 has been Bangle-fied. 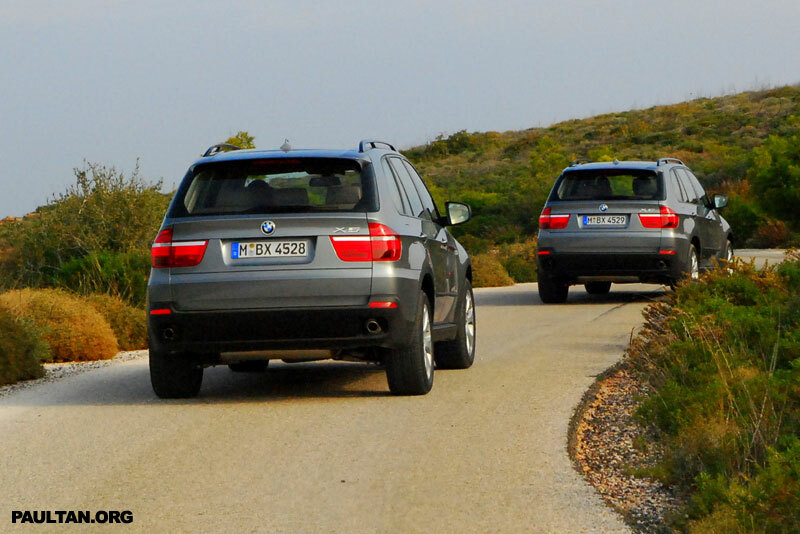 Look at the video below, it shows you the comparison between the new X5 and the old X5 in a similar morphing action that BMW used for its 3 Coupe vs 3 Sedan comparison video. At first glance, the new BMW X5 actually looks smaller than the model it replaces, thanks to Chris Bangle’s design cues. On the front, you have wider kidney grilles, newly designed headlamps with the trademark corona rings that also integrated daytime running lights. The 2007 BMW X5 4.8i’s kidney grilles were silver while the 3.0d turbodiesel version had them in black. The mesh grille at the bumper follows the same color trim. The lower grille is flanked by two other openings, but they are only a design feature on the 4.8i, while the 3.0d has an opening on the left hand side to allow airflow for the turbodiesel’s intercooler. On the rear, both cars have stylish twin exhaust pipes integrated into the rear bumper, but the turbodiesel gets some metal round pipes while the V8 model gets some nicer chromed oval tips. 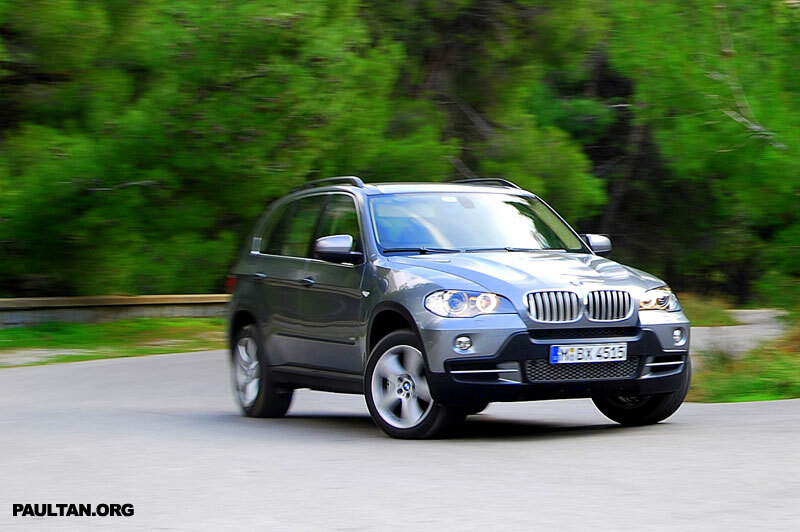 One challenge that BMW designers faced when designing the new 2007 BMW X5 is how to make the car larger (187mm longer and 6.8cm wider) and integrate the two optional additional seats at the back without making the car look like a huge and boring van. The new X5 has a relatively short rear overhang, while as with all BMWs the front overhang is also extremely minimal. The rear overhang was also designed to hide the rear seats, so at first glance you won’t notice them. I suppose this is why I feel the new X5 looks smaller than the predecessor despite actually being bigger, it’s all the Bangle cues at work! On the interior, you step into a much bigger space than it’s predecessor. 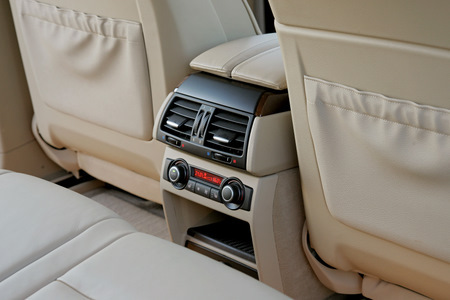 Often complaints have been made about the lack of interior space with the old X5, it’s amazing how it sold so well. 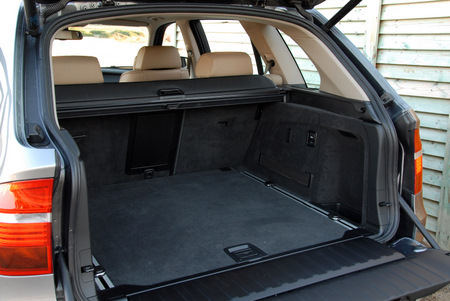 The new E70 X5 solves that problem, there is ample room everywhere. However this isn’t exactly a people carrier that can fit 7 adults, the rear seats are only comfortable for children on long hauls, other than that expect to fit in 7 people only for short drives of about thirty minutes or so. There is 40mm more legroom in the middle row, which can accommodate a person of about 190cm tall. There is an optional 4 zone air conditioning system, two zones for the front and two zones for the rear. Also an option that will make the X5 a favourite with the children, there is an 8 inch LCD screen option for the rear that can play DVDs. This entertainment system comes with a remote control and wireless headphones. 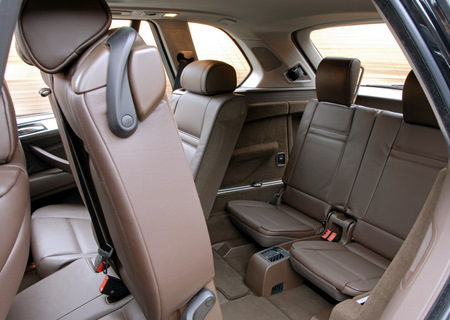 The cream leather seats with electric adjustments are very comfy, but pretty much expected from a luxury SAV like the BMW X5. 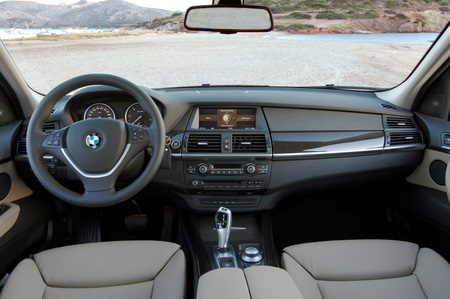 The entertainment system is built into the iDrive system. 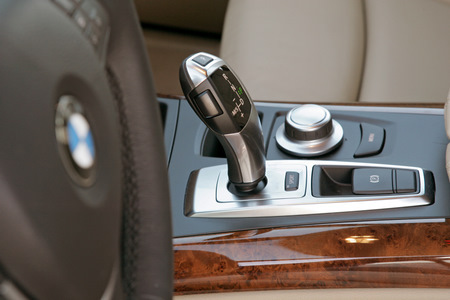 The iDrive system itself is improved. It now has favorite buttons which are touch sensitive, you just touch your finger on it and it shows you what it does – which can be selected from a choice of telephone numbers to call, radio stations to play, or navigation destinations for the satellite navigation system. If the button is the one you decide you want to choose, then just press. Much better than pressing the button to see what does and choosing an OK button somewhere. Good interface design. Another improvement is the iDrive knob actually gives you feedback when you’ve finished scrolling through the menu options, it resists being turned a little even though if you wanted you could force it to scroll. It’s iDrive’s way of saying you’ve scrolled to the end, there’s no point turning anymore! Back to the entertainment system itself, the standard system is a 7.2 system – 7 speakers and two sub woofers, while a premium 16 speaker system is optional. BMW says this is the first SAV with a heads up display, which displays information like speed and navigation instructions projected in a typical BMW orange font on the windscreen. Makes life a little easier, not having to shift eyes to and fro the meter panel to check on your speed, as well as refer to the iDrive LCD screen in the middle of the dash for navigational instructions. 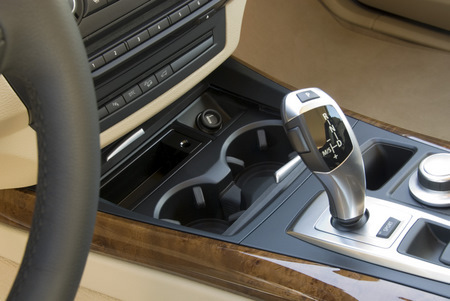 The gear shift is the new Shift by Wire system, which is basically an adaptation of the shift stalk on the 7-series moved to the traditional location on the center console area between the seats. The shifter is a soft shifter, which means there are no actual gear positions for you to shift into, you just move the shifter up and down and left and right, similar to Alfa’s Selespeed shifter. Even the parking brake is activated by a button. On to the new E70 chassis. Chassis rigidity has been improved, 15% higher now at 27,000Nm per degree. As a reference to show you how good this is, the old BMW M3 E30 race car fully equipped with a roll cage has 22,500Nm per degree chassis rigidity, that’s less than the new E70 2007 BMW X5! Drag coefficient is also better, it is now 0.33cd compared with the old X5’s 0.35cd. Translating the numbers onto the track, the new BMW X5 4.8 does the Nurburgring North track in 9 minutes, that’s 10 seconds faster than the old X5 4.8 time. 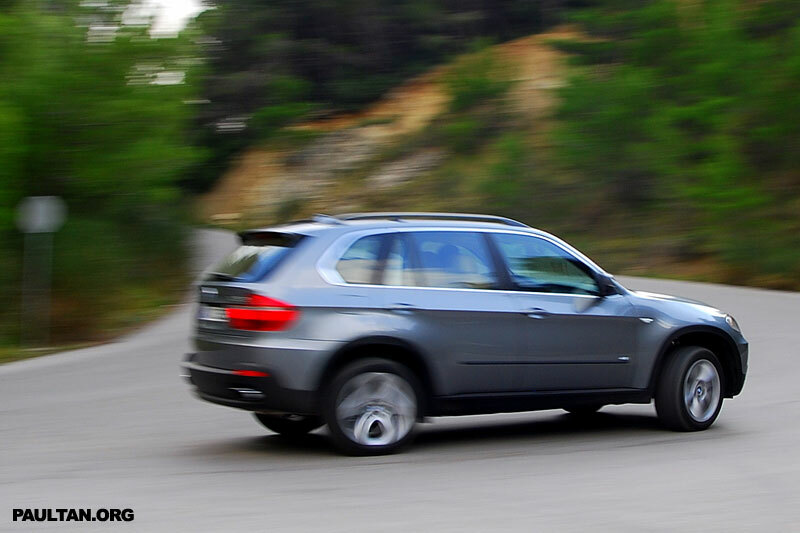 Despite being larger than the old X5, the weight stays about the same thanks to weight reduction methods like an aluminium engine hood, cast aluminium front strut tower, magnesium carrier for instrument panel, and intelligent use of high strength steel. As with all BMW’s, weight distribution between the front and rear axle is 50:50. The new E70 2007 BMW X5 is also the first BMW with both Active Steering and xDrive in the same car. 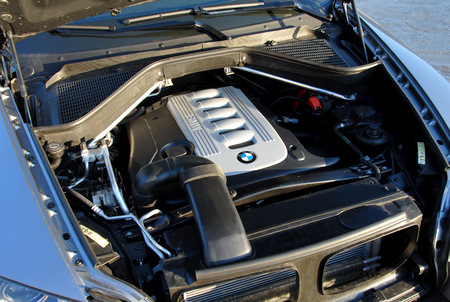 BMW previously had packaging problems including the Active Steering module in an engine bay that had the xDrive 4WD system. 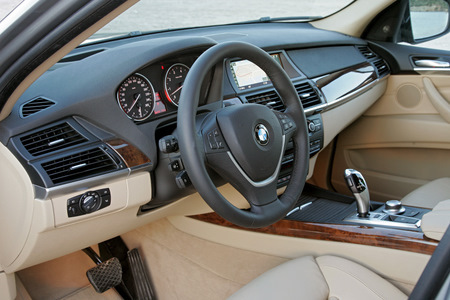 Thus cars like the 335xi and the xDrive 5-series do not have Active Steering despite being very high trimmed. For those not acquainted with the Active Steering system, it basically increases the steering ratio at low speeds and does the opposite for high speeds. At highway speeds, a certain degree turn of the steering doesn’t turn the wheels much, this helps with maintaining car control at high speeds, while at low speeds a turn of the steering turns the car a lot more to assist with parking. 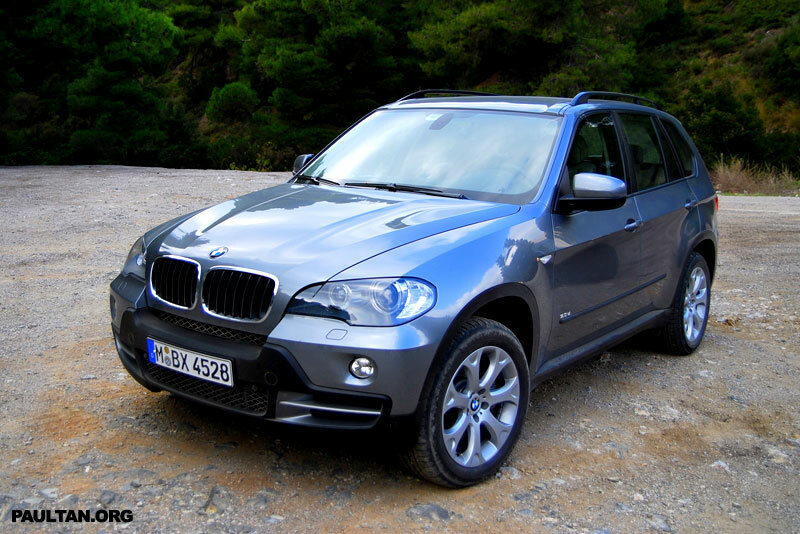 The 2007 BMW X5’s xDrive is very advanced, it can split torque between the front and rear by 0:100, this means that power can either go fully to the front or back. You really have to appreciate all the technology BMW has put into the car. During the first leg of the test drive session in the BMW X5 4.8i, while following two other X5s in front carrying other Malaysian journalists, I took a sharp corner pretty fast, and unlucky me had to have the road suddenly change from proper tar to cement right in the middle of the corner, so the car went really crazy sliding around for a few seconds. Understeer, oversteer, understeer one after the other, and tyres screetching like mad, but during all the drama a combination of xDrive, Active Steering, Adaptive Drive, and DSC was working hard at getting the car under control again, so with a few counter-steers of the steering the car (made precise with Active Steering, it actually detects situations that require countersteer and helps you countersteer just the right amount with precision!) was pointing the way I wanted it to go again. Honestly, the reason why I entered the corner very fast was because I thought the X5 4.8i could take it, and technically since I didn’t end up in a ditch, it could, sorting itself out the dramatic episode swiftly. Did you notice the new term? BMW Adaptive Drive. 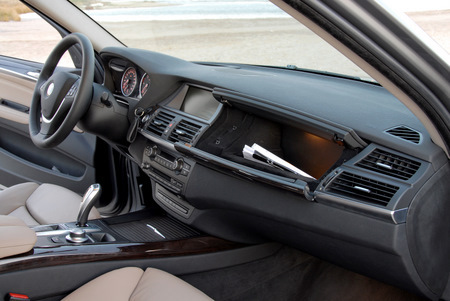 That’s what BMW is calling its new optional system that manages pitch and roll of the car for a more comfortable drive. It actually uses a variable anti-roll bar system which has variable torque. Watch the video below to find out how Adaptive Drive works. We tested both the 4.8 litre V8 petrol and the 3.0 litre turbodiesel single turbo model. My pick would have to be the 3.0d. It’s more fuel efficient, and the massive torque it provides is just so addictive, though you don’t get to enjoy much of it as the redline in every gear is hit very fast). The 4.8 litre is more powerful and has a wider more usable powerband though, redlining at 7,000rpm. 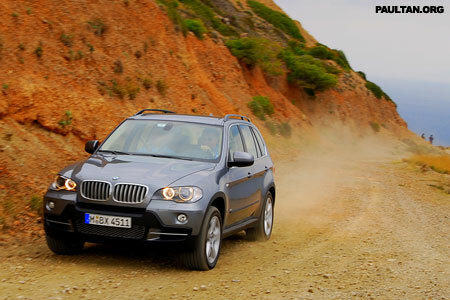 It absolutely demolished the roads of the Peninsular of Attica near Athens, Greece where the test drives were held. It sounds absolutely wonderful from the inside, and even more intoxicating from the outside! That V8 grumble is really unforgettable. The 4.8 litre V8 makes 350 hp and 475Nm available from a low 2750rpm while the turbodiesel does 232 hp and 520Nm of torque between 2000 and 2750rpm. But it is a little too willing to downshift, and lurches forward too suddenly with too much force too often, making the 3.0d seem more appealing. I’ve never thought I’d say a car was too powerful, heh! 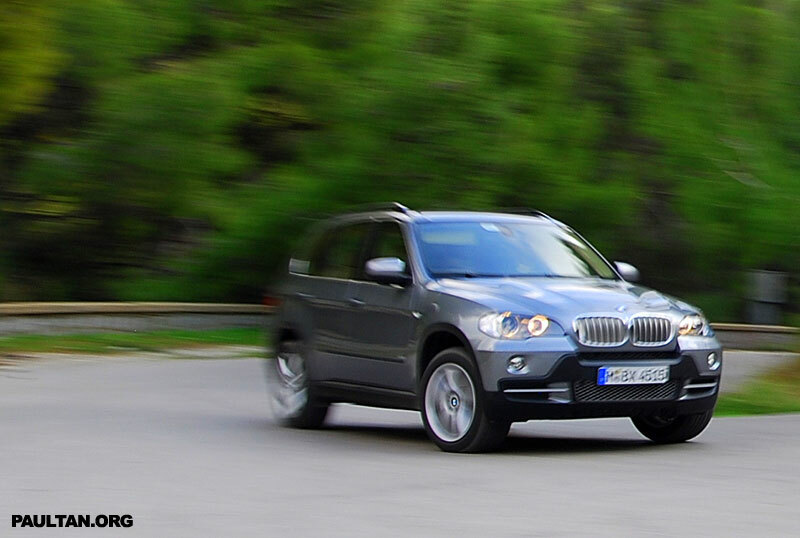 The BMW X5 4.8i’s has a front double wishbone suspension system with electronic dampers. The wonders of engineering. 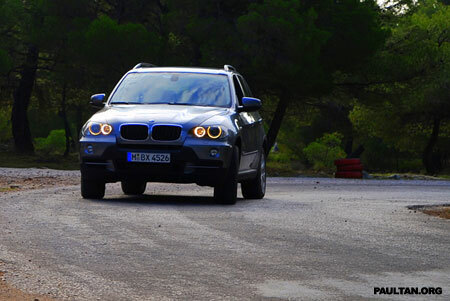 It’s a different story with the 3.0d though, where the test car did not have Adaptive Drive, so body roll was excessive on the X5 3.0d and it didn’t really feel very confident at all around the corners. Perhaps it was because I was comparing it too much with the 4.8 which was equipped with Adaptive Drive. Not exactly what I would call car-like dynamics in the 3.0d, but the 4.8i holds true to that claim. I expected more out of the ride comfort from the X5 since it is one of the higher end BMWs, but I suppose the run-flat tyres were the culprit, taking away some comfort in exchange for the weight reduction and space savings of not having a spare tyre to keep in the car. The 6-speed automatic gearbox is ZF’s new unit that is said to be able to shift 50% faster than traditional torque converter gearboxes. I found the ratios pretty suitable for each engine, and the 4.8i’s gearbox was very very willing to downshift with every harder press of the throttle pedal the 3.0d was much more sedated and comfortable to drive. 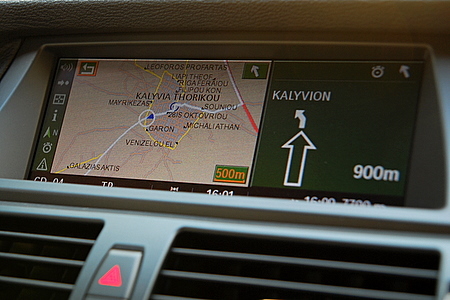 The iDrive’s GPS system worked marvelously. We used it at the end of our test drive to find the quickest route back to the hotel, as the route book we were given contained paths that gave the most driving experience, not the shortest and fastest route. Despite being aliens in Athens, Greece, thanks to the navigation system we found ourselves back to the Grand Lagonassi Resort. On to utility, the boot carries a massive 620 litres of cargo. A majority of that 620 litres of cargo disappears when you raise up the 2 optional 6th and 7th seats from the boot floor though. The boot door opens in a split to form a roof and a seat, which could allow you a little socializing time sitting on the tailgate and having tea perhaps? 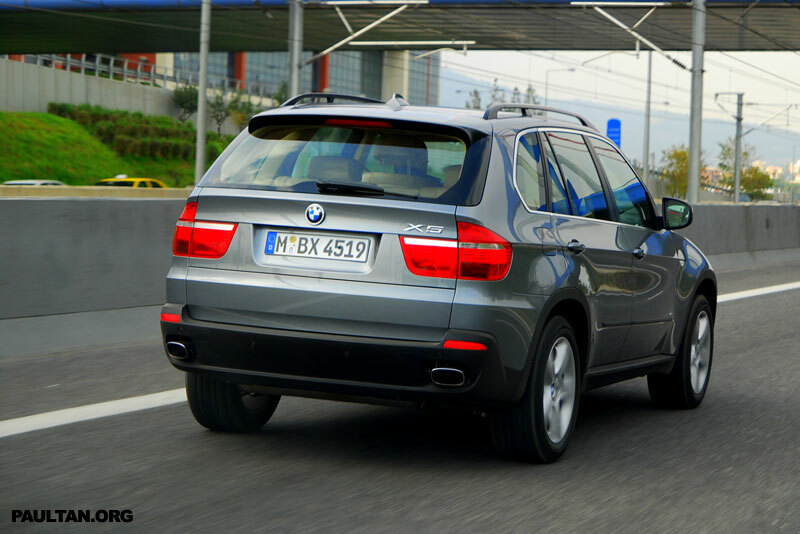 With 41% of the first generation’s demand coming form the US, it only makes sense that the new E70 BMW X5 is built at Spartanburg, South Carolina in the US. It will be coming to Malaysia in Q3 2007. 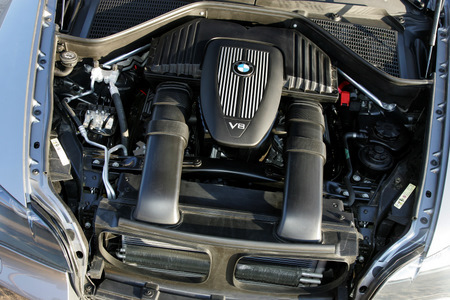 Other engine options other than the 4.8i and 3.0d will be the 3.0i and the 3.5d. The 3.5d is expected to come much later as the engine is in short supply right now. As with other BMW cars like the 5-series, BMW has succeeded in amazingly turning something that looks big, lumbering and clumsy into a great piece of engineering. One thing I’ve noticed about both the 5 and the X5 is that it doesn’t feel like you’re handling a big car from the inside. For the moment while the 3.5d is still unavailable, give me the 3.0d model please, but the optional Adaptive Drive system is an absolute must. It’s a really amazing piece of technology that completely changes how the ride feels. For more technical details, read my previous post on the E70 X5. Enjoy the rest of the photos, taken with a Nikon D80 and Tamron 17-50mm f/2.8. Click the photos for enlarged versions. If you want bigger sizes for wallpaper use, contact me.